In my spring "Favorite Things" list (read that post here) I included Chobani Flip "Almond Coco Loco" Greek Yogurt as one of those things that I just can't live without. This genius treat combines coconut-flavored yogurt with dark chocolate and almond mix ins. It's to die for - and quasi healthy too. This stuff is so good it got my wheels turning on how to turn this into a granola with the same flavors but while getting some extra fiber up in ya. This is what I came up with. 2. 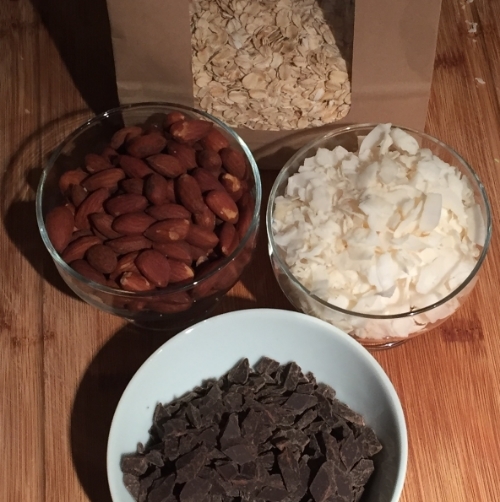 Mix the oats, coconut chips, sugar, salt, and almonds together in a large bowl. 3. In a small sauce pan over medium-low heat, add the coconut oil, sugar and honey/agave. 4. Once the sugar and oil have melted, pour over the dry ingredients and mix well. 5. Spread the mixture evenly onto one large or two small baking sheets and bake for 20-25 minutes. Stir near the halfway point to ensure even cooking (be sure to watch it carefully toward the end as it can burn quickly). 6. 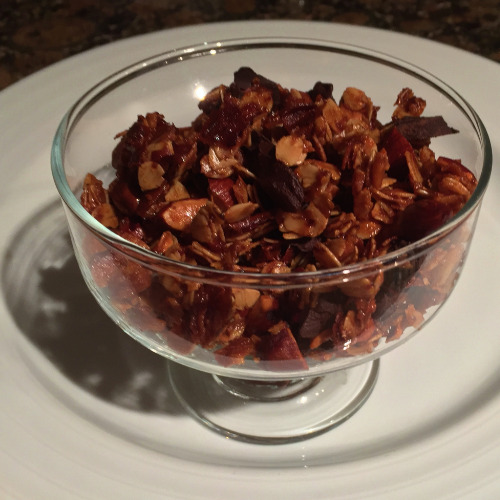 Once the granola is visibly browned (about 25 minutes for me), remove from the oven and let cool completely. 8. Once cooled, add chopped dark chocolate and toss. Store in an air-tight container. 9. Serve over yogurt (use coconut flavored yogurt for even more coconut flavor) or just by itself as a snack. For more information about Chobani's products and beliefs, click here.